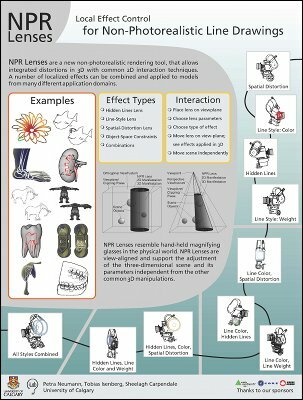 NPR Lenses is an interactive technique for producing expressive non-photorealistic renderings. It provides an intuitive visual interaction tool for illustrators, allowing them to seamlessly apply a large variety of emphasis techniques. Advantages of 3D scene manipulation are combined with the capabilities of viewer-aligned lenses by inserting 2D lens controls into the 3D rendering pipeline. By using lenses that are spatially explicit and constrained we enable object-independent adjustments in 3D. Regions of emphasis can be easily created by adjusting lens parameters and any combination of line style, type, shape, and position of computer-generated lines. NPR Lenses support the creation of effects similar to those found in many existing hand-drawn illustrations and allow creative freedom through interactive control at the same time. Download the video as AVI-MPEG4 (13.8MB) or watch it on YouTube. This work was done at the Innovis group at the Interactions Lab of the University of Calgary, Canada, based on work done at the University of Magdeburg, Germany.